The "Sonnenblume" celebrates the seventh anniversary of the founding of the association on 18.12.2009. Many thanks to all our members, friends, supporters and companions in these years! Children of the GGS Satzvey play Santa Claus and donate for the sunflower e.V. Anxiously waiting children for the Nicholas day, they have candy or other small gifts in the boots. The pupils and students of elementary school Satzvey wanted to actively present this year. So that the children and the headmaster of the Gmeinschaftsgrundschule Satzvey, Stefan Plack, once again come to leave a donation of remarkable €587,63 to the Association "The Sunflower - Association to help Ethiopian kinder e.V.". 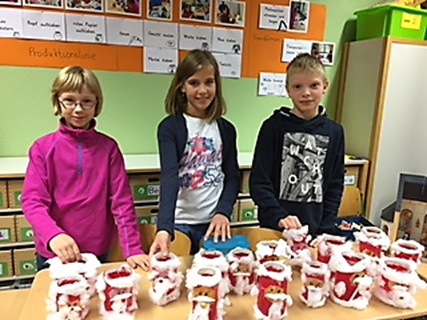 For this purpose, the children of the fourth classes under direction of the class teachers Alexandra Offermann and Christiane Wehrle - had sold first, lanterns, which had made it before as a project in studying thing in a self-developed production line. The visitors of the annual flea market were very fond of the beautiful products of children and supported their project happy. Small pocket money donations by the pupils and students, which were collected in the Nicholas celebrations in handmade boxes and it reminded that the Nikolaus Kinder like supported in emergency were added. The GGS Satzvey supports the Association to Erdaw Miko, who committed to the establishment of the school in the Ethiopian Menjikso Tade, for several years. So Erdaw Miko visited the elementary school and was able to show the students with the help of photos, what great progress was done since the donations were used direct 1:1 for the school and the children in Ethiopia. So not only a great school is created, also for the operation of the school for more important projects, such as the construction of a fountain, were carried out with the donations.At regular intervals, and with different actions support the students community primary school Satzvey this great project and are pleased that they help to provide school children in this very poor region in the world. Dear friends, we are back online! A lot came together - we had to change the hosting provider for the web page during the summer, and it turned out that our site had been attacked. Fortunately this had no direct consequences for the visitors of our site, but we had to completely rebuild the site and will run it ourselves in future. Please be aware that not all details have been restored yet - we are working on that. We are also thankful for any suggestion or critique! The board of "Sonnenblume e.V." 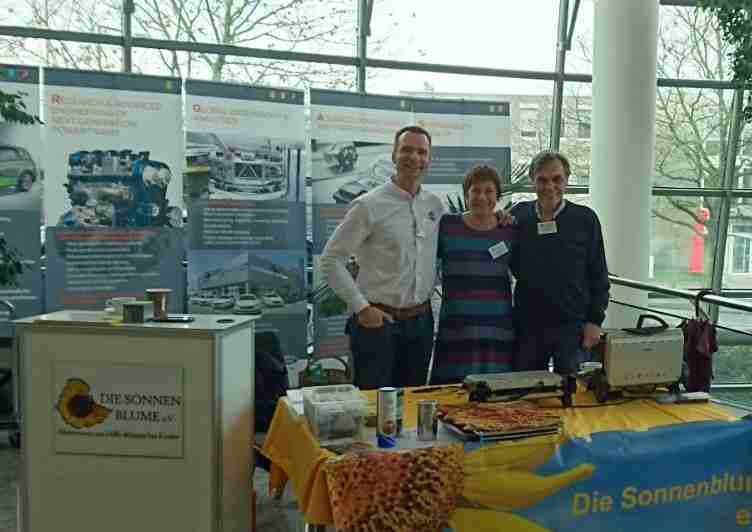 For the "Health Day" at the Research Center Aachen on 17 November 2016 Lisa Lang had invited us to bake waffles. Fitting the occasion, the waffles this time were made from whole meal spelt flour, cane sugar and organic eggs. The Ford staff and guests enjoyed them – and we collected donations of over €150!